JOIN OUR MONCTON AXE THROWING LEAGUE! 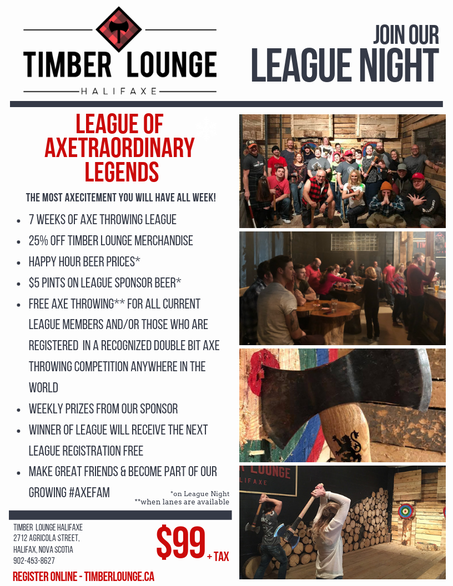 ​Join us for our league nights and AXEperience the competitive spirit of axe throwing. Our league brings together great people who love to throw axes and enjoy a unique social scene. No experience necessary, our professional coaches will give you instruction and pointers, as you compete on an individual basis. Forge new friendships and have lots of fun while doing it! Our axe throwing leagues will run for 7 weeks, and consist of a warm up each night prior to 3-4 rounds each night during the 6 weeks of regulation play. The 7th week is a playoff night on which the top 16 competitors will face off in a double-elimination tournament crowning a winner for the season. Hands On Instructions & Guidance will be provided during each session.